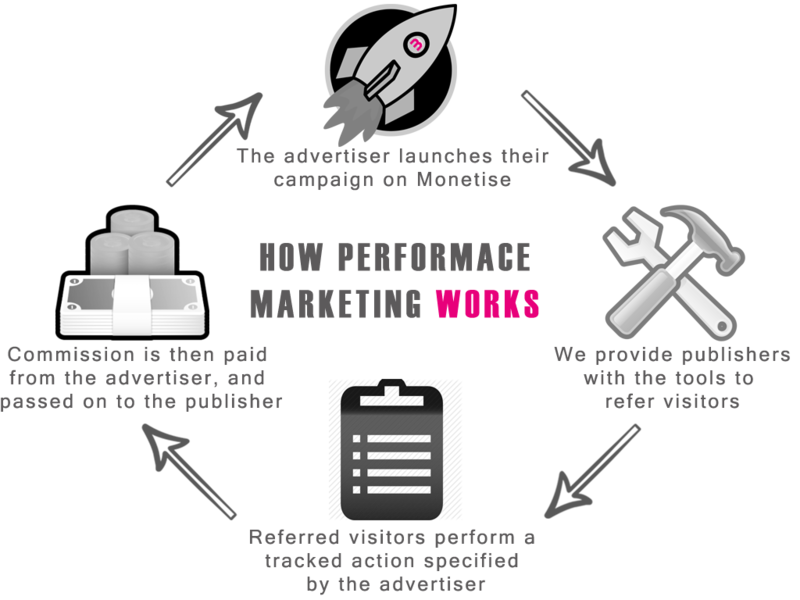 Monetise is a performance marketing network (or ‘affiliate network’). We work with brands, advertisers, and mobile application developers who are seeking additional customer acquisition opportunities whilst rewarding publishers (or ‘affiliates’) for their referral activity. We pride ourselves on the quality of our advertiser and publisher partnerships that thrive due to our obsessive support and industry-leading technology. Every business is different, but together we can be part of something more. Monetise knows precisely which publishers, advertisers and agencies are best-suited to each other’s needs, like putting together the pieces of a puzzle. Performance marketing that works for everyone. It’s what we do. “I would recommend Monetise to anyone looking to drive more traffic to their site through the affiliate channel”. Performance marketing (or ‘affiliate marketing’) represents a marketing channel, where advertisers are able to reward publishers for sales or leads generated through that publisher’s web or mobile marketing platforms. The advertiser increases lead volume (or sales revenue) and brand awareness whilst the publisher is paid a referral commission for the resulting lead, sale, or mobile application install. Thus, the advertiser is able to advertise without risk, and the publisher benefits from their marketing performance. The process begins with the publisher promoting the advertiser’s campaign which can be done using website links (both image and text links), email marketing, display advertising, paid search, in-app, or other marketing channels. When a referred visitor clicks on the publisher’s link, a cookie is stored on the visitor’s computer or mobile device which allows for any sale, lead or install to be tracked and recorded (we also use cookieless tracking). The publisher who generated the payable action is then rewarded by payment of the agreed commission. Whether you’re a moderate business, an experienced media buyer or an agency seeking to generate leads for your clients – we have the tools and the insight to meet your objectives. Monetise, after all, means ‘to give value to’. And by marrying smart technology with an intuitive understanding of our customer’s needs, we’re constantly raising the bar in a way that adds real value to your business.